Reva meets her parents. Check out the 10th episode of #MOT Marathi fictional web series. Season One finale of #MOT. The end is just the beginning. Episode 10 of #MovingOut Season 2 - An Arré Marathi Original Web Series with Reverb Katta streaming NOW. Can love ever go wrong? 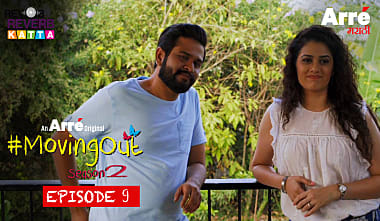 Episode 9 of #MovingOut Season 2 - An Arré Marathi Original Web Series with Reverb Katta streaming NOW. Love can be full of ups and downs. But is it worth it? Watch Episode 8 of #MovingOut Season 2 - An Arré Marathi Original Web Series with Reverb Katta streaming NOW. Starting anew tends to carry a sense of familiarity. The heart always recognizes. Watch Episode 7 of #MovingOut Season 2 - An Arré Marathi Original Web Series with Reverb Katta streaming NOW. Love is a test. Can you ace it? Watch Episode 6 of #MovingOut Season 2, An Arré Marathi Original Web Series with Reverb Katta streaming NOW.